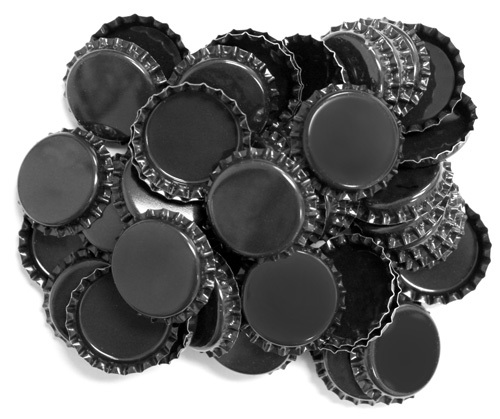 Find out why crafters, scrappers and jewelry makers are loving our new two sided black bottle caps! There's color on both sides! Design on the inside of the cap and still get that great black border that will make your designs pop. Scrappers and paper crafters save some money! No need for the circle foam mounting stickers! Add your design to the inside of the cap, adhere the top of the standard cap or flattened cap to the page with glue or two sided tape and still see the color. Make your bottle cap jewelry more charming!! 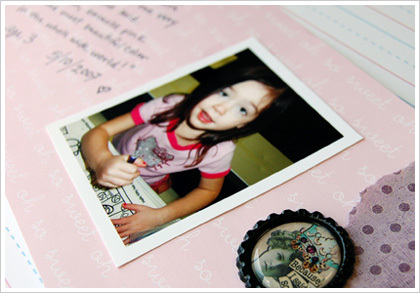 Add your design to the inside of the cap and hang the charms inside! You'll still see that beautiful black border. Go 3D with your designs inside the cap and, guess what I'm going to say, ... you'll still see that beautiful black border! 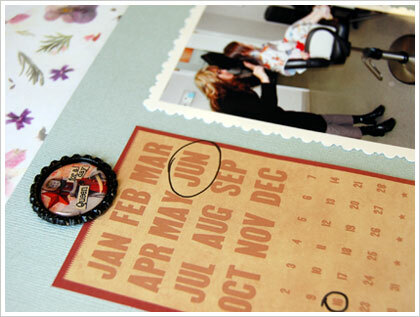 Beautiful and quick, scrap book page embellishments! 1 Flattened black bottle cap + 1 epoxy sticker = 1 unique page embellishment. Have another idea? Questions, comments ... we would love to hear them! Post a comment or email us a pic! Hi! I just started using the epoxy dots on my bottle cap designs but I'm having trouble getting them to "completely flatten down on the digital image and it's making it look a little "cloudy" instead of a nice shiny finish underneath the epoxy dot. I hope this makes sense! I considered putting a coat of glaze on the image and then applying the epoxy dot but I wasn't sure if that would take care of the problem. Any help with this would be greatly appreciated. Love the website and products! Hello, thank you for your question. Are you using epoxy dots that you purchased at Bottle Cap Co? What kind of paper are the images printed on? I'd love to help you figure this out as we haven't had this question before. Also feel free to call our Customer Service number or email us if you need an immediate response. Thanks! Surely, at BCco. you have some experience with this. I would greatly appreciate your thoughts on this. I believe using the Xyron sticker paper also solves the problem, but if you don't have one...I would suggest using the glossy paper. Hello and thank you for your question! I think there are two issues that you've expressed. The first is about paper choice for printing images. I highly recommend gloss or semi gloss photo paper. If there is any texture or tooth to the paper the epoxy dot cannot seal entirely to the surface. That is why the image would then look "glittery or cloudy" as you mentioned. completely dry before setting them outside at your booth. I hope this helps! Please call us or post another comment if you have any more problems. I like to put the images on the outside, but when I wear the necklace, the cap always turn around and the image is not seen. Is there anything I can do to prevent the cap from turning over besides putting an image on both sides?